John Langan's "The Fisherman" has a lot of what I've found to be lacking in recent novels by Stephen King. Set in a small town, with credible characters and elements of the supernatural that are introduced subtly, with well built tension along the way. As Abe and Dan, two widowers, try to come to terms with their loses, they discover a passion for fishing. This hobby brings them close together, but it also gets them tangled in an old and dark tale that. There's a nice story-within a story that sets the scene for the main events in the novel. At times it even feels Lovecraftian with dark cults and larger-than-life dark creatures. 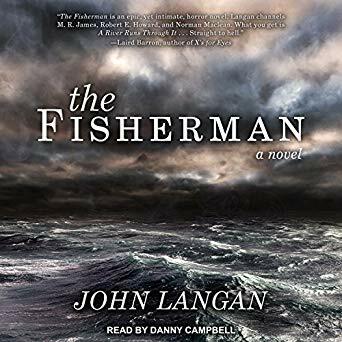 I really liked the way Langan moves smoothly from a hearsay tale filled with ominous evil to present narrative, without losing the pace and managing to maintain the suffocating atmosphere. Also, his vision of afterlife is really interesting, even though it is unsettling too.